The R&S®Series4200 represents the latest generation of stationary radios for both civil and military air traffic control. The R&S®Series4200 represents the latest generation of stationary radios for both civil and military air traffic control. Possible applications range from small airport emergency systems requiring only a few radio channels to countrywide communications systems with several hundred radio channels. The R&S®Series4200 is available in six versions: transceiver, transmitter and compact receiver. The R&S®Series4200 radios for the VHF frequency range (112 MHz to 156 MHz) are suitable for civil applications. The R&S®Series4200 radios for the UHF frequency range (225 MHz to 400 MHz) are suitable for applications in military air traffic control (air force, navy, army aviation forces). The UHF transceiver allows an external encryption device to be connected. The R&S®Series4200 offers an extremely wide range of possible configurations, allowing optimal adaptation to the desired application scenario. The radios were implemented on a software basis in order to provide users of the R&S®Series4200 with the widest possible range of applications. 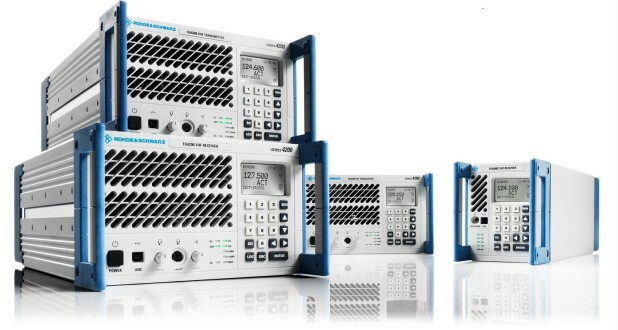 New functions are implemented through software upgrades that Rohde & Schwarz makes available. All radios of the R&S®Series4200 are multichannel radios, but they can also be software-configured for reliable operation as single-channel radios. Redundant operation of two radios in order to boost the channel availability is possible without any external monitoring and switching equipment. Standard functions include 8.33/25 kHz channel spacing for VHF and 8.33/12.5/25 kHz channel spacing for UHF, carrier offset 1 to 5 (VHF), ACARS and VDL mode 2 data mode (VHF), LAN remote-control interface, serial interface for controlling automatic filters, and in-band signaling for push-to-talk (PTT) and squelch (SQ) with the capability to set different tones. The R&S®Series4200 radios support digital voice transmission using the ITU-T G.703 PCM interface and VoIP in accordance with EUROCAE specifications.